Or: Spend hours cooking trying to come up with a new name for this dish. Like any chaos-cooking session, I like to start with those millions of internet recipes. Usually there’s some sort of basic thread to follow and I have a framework where I can move about freely. That is not the case with pulled pork. 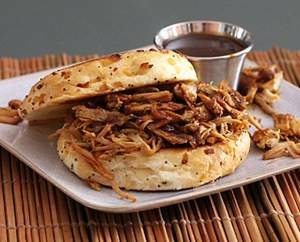 There seems to be forums dedicated to the perfection of the pulled pork experience. Some smoke the meat, some bake it but general consensus is that the best way to make this is in a slow cooker. I don’t have a slow cooker. The last time I looked for one in Germany, they were like 250€. At that time I bought a pressure cooker instead coz that cooks the daylights out of meat too. But I don’t want to do that now. I want to perfect this experience. Well-known huge internet shop to the rescue! There’s a German importer who posts slow-cookers from England and ships ready-to-go with an adapter for our plugs. Ordered on Tuesday, it is on my door step on Thursday. Now I have to sort out the cut-of-meat thing. More surfing is necessary. I find maps of The Body-of-Swine, find the English words and throw them into the handy-dandy Leo translator. Now we’re set to go and buy a five-pound slab of pig neck. I want to do my own barbeque sauce, so I’m going make this up. I start with two red peppers, a large sweet onion and brown them in oil in a large pot. Throw some garlic in there, powdered paprika and before it burns, add 1 liter pureed, unseasoned tomato sauce. Now open the condiments cabinet and throw everything in there that seems like it would fit to barbeque sauce. Chipotole Tabasco, Old Bay, Worschestststser Sauce (those crazy Brits! ), brown sugar, sugar-beet syrup, catsup, mustard. My family aren’t really spicy eaters, so I keep it mild and sweet. Salt, pepper. Cook for a few hours then puree the whole thing with your destructive implement of choice. Set aside. Since I want to make this for Sunday lunch, the fun starts around 9 pm. I cut the slab of pig neck into five pieces trying not to spill the wine cup or cut my fingers off with my dull knives. (I am not allowed to have sharp knives.) The unbrowned meat (there are forums dedicated to the browning question!) goes into the slow-cooker with 500ml of jarred beef broth and a few ladles of my sauce, just enough that the meat is covered with liquid. Now I had read somewhere that some people cook the meat in water. That’s plain gross. I’ve heard of using beer, broth, one could use wine if there was any left. Root beer sounds really good, too. The slow-cooker is now set on low. Wine in hand, the weekend is saved! Now the whole house smells like meat. I shut off the slow-cooker and examine my patient and wonder what to do now. Ok, I read somewhere that I could reduce this liquid and use it in the sauce. So I set the meat aside and reduce the juice in a pot on the stove right down until about a quarter of it is left and then top it up with my barbeque sauce. The pork is then shredded with forks. Never did I pull this. Never. Back in the slow-cooker, the meat is then dribbled with sauce. I didn’t put all of it in. I thought they might like to add their own. By the way, this gets put in a roll. I would suggest a crusty kind of hard roll. I had to explain this to those not yet enlightened. At some point we had made cole-slaw, too. Must have been when the juice was reducing. I have a great recipe and if you’d like it, let me know. This entry was posted in Food and Drink on April 22, 2013 by lauralibricz.